Lakeside Socks, Louet Spindle, and… a Babe wheel? 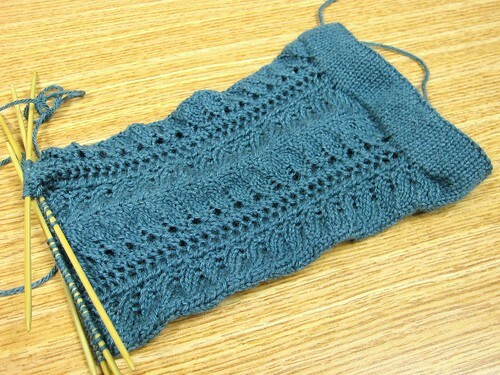 I’m actually not knitting on anything else right now, so I don’t have anything else interesting to share right now. I’ve been working on just one project at a time lately and feel like I don’t have a whole lot to say! In non-knitting, but fiber related news, I’ve been playing with the top whorl spindle that came in the mail a week ago. I just realized that I hadn’t even mentioned it here! I bought a spindle from Louet. I really wanted a Golding, but decided a lower cost version was needed first. As much as I think I like spinning (and I’ve done okay with the bottom whorl one I had), I’m a little afraid I’ll try it and not like it suddenly. Of course this hasn’t happened yet at all, in fact the more I do and try with fiber, the more I love it and want a wheel! But, thinking about cost and not being sure if I’d like the top whorl better than the bottom whorl one, I bought a simple Louet spindle. It sat on my desk for almost a week (hey, I was distracted by those socks up there! ), but yesterday I sat down and watched this YouTube video on how to get started (there’s also a helpful one on drafting). Both of the videos were quite helpful! I drafted out my fiber and then had a go at it. Oh boy was it fun!! Took me a while, but I was able to get a thinner, more consistent “yarn” by the time I put it down yesterday. I don’t have a picture to share right now, but I hope to take one tomorrow! The only part I’m having a bit of trouble with is drafting. I’m afraid of pulling the fibers too far apart that they will separate, but the thinner I draft it out, the thinner yarn I can make. I keep seeing folks with really finely spun yarn on their spindles and I admit I’m a bit jealous. I know that my skill is just not there yet and I have to keep practicing! Hooray for new spinning gear! 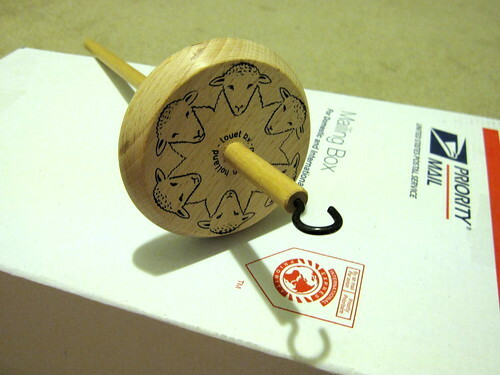 The spindle is so cute! You are absolutely right, girl! Some fiber will pull apart if you pre-draft it too thin. It depends on the size of the staple (length of the sheep hair strand). If they are really short you may not be able to pull it far apart unless you have a really fast spin going on. I’m not sure you can go that fast on the spindle. Others pull apart really far because the staple is very long (5-6″). Once you get your wheel it will be a lot easier!! The socks are looking marvelous!! !